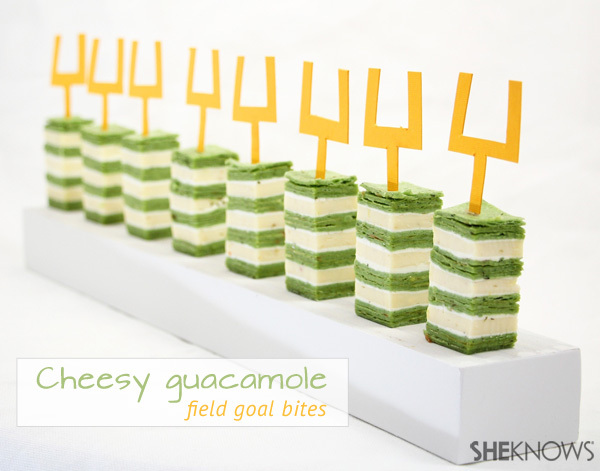 Make your Super Bowl party even more fun with these football field-inspired snacks. Throwing a Super Bowl party? Give your football fans an appetizer they’re sure to cheer about. These green and white-striped guacamole bites will score some big points because they have an added kick of pepper jack cheese. 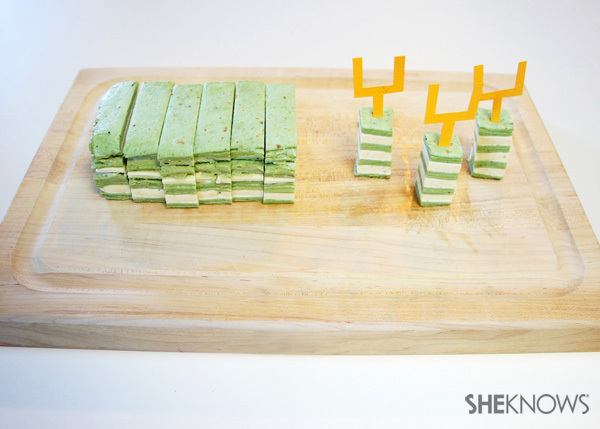 And these toothpicks topped with paper field goal posts are sure to earn you the MVPP (Most Valuable Party Planner) award. 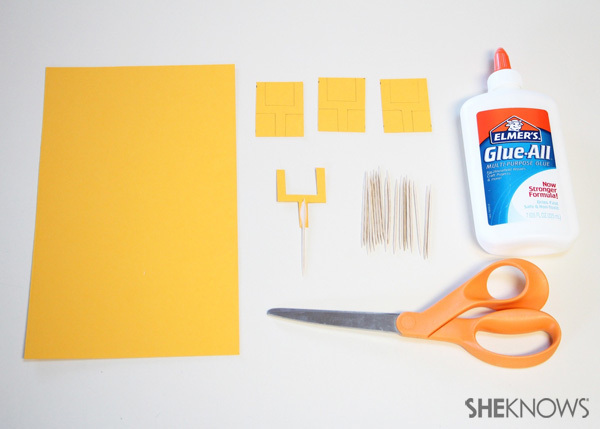 Cut approximately 21 (1.5 x 2-inch) rectangles from a sheet of yellow card stock paper. Lightly draw a field goal shape on the first one, cut it out and trace the shape on the other pieces. Cut the remaining field goal posts. Glue the bottoms of the field goal posts to the top 1-inch of each toothpick. Allow them to dry for 4 hours before using. 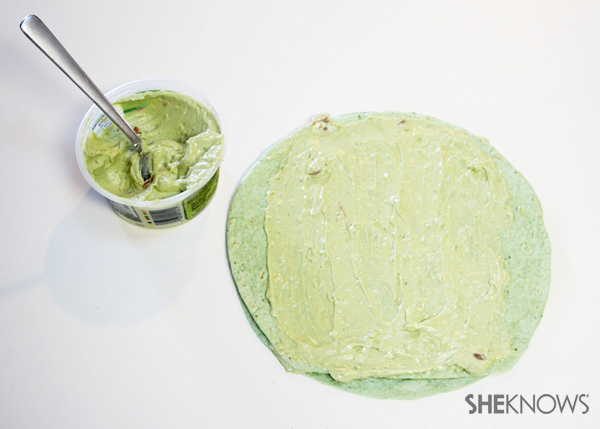 Spreading guacamole dip on the top of 1 spinach wrap. Layer a second spinach wrap on top and spread more guacamole on top of that. 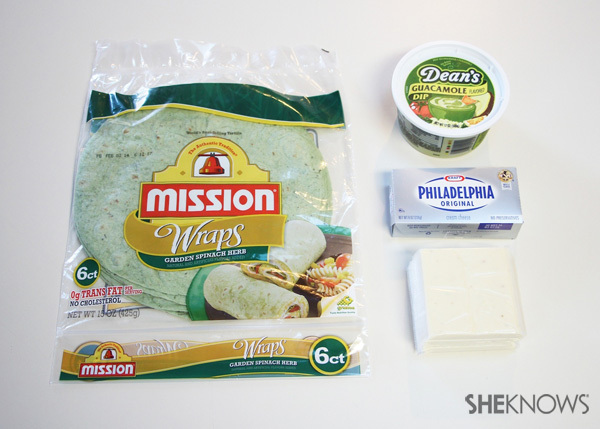 Layer a third spinach wrap on top and spread cream cheese over it. Add 8 slices of pepper jack cheese (2 layers of 4) to form a square. 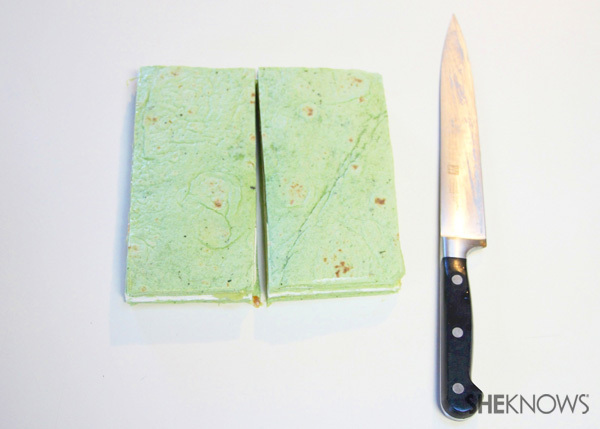 Take the fourth spinach wrap and spread cream cheese over it. 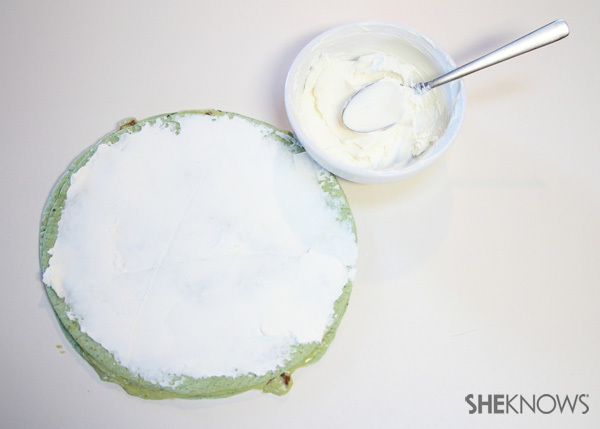 Place the wrap cream cheese side down on top of the cheese slices, like a sandwich. Then add the next 3 spinach wraps on top with a layer of guacamole in between each one, ending with a plain spinach wrap on top. Trim off the rounded sides and cut in half to form 2 rectangles. 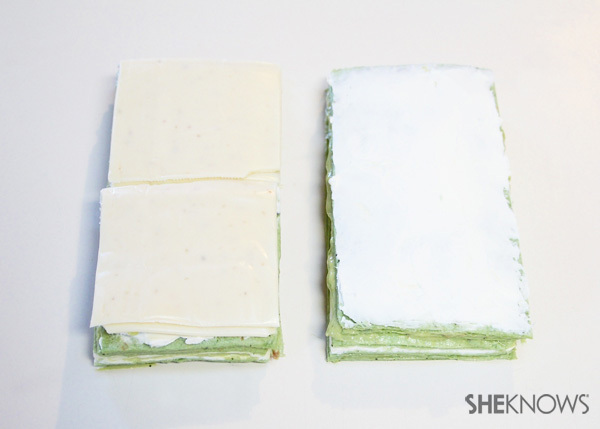 Spread cream cheese over the top of each rectangle. Add 4 slices of pepper jack cheese to the left rectangle. Take the right rectangle and flip it over on top of the left. This will give you 4 layers of green and 3 layers of white. 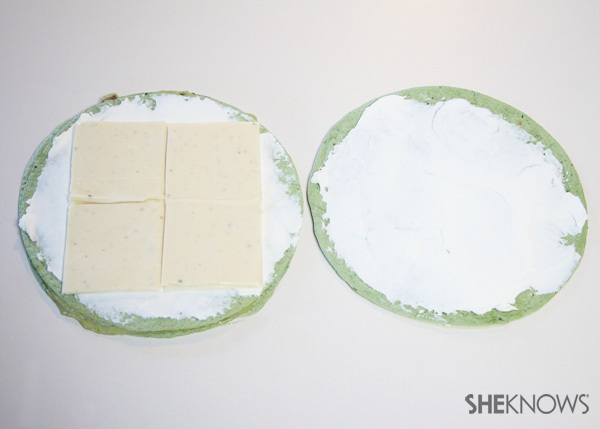 Wrap the whole thing in plastic food wrap and refrigerate for a few hours or overnight. 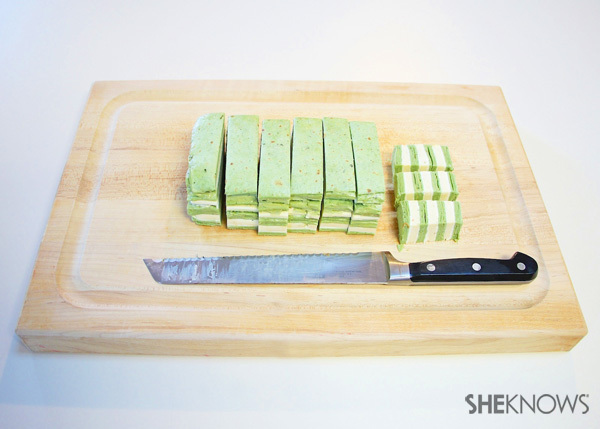 To slice, use a sharp knife to cut and even all 4 sides. Slice into 7 equal strips. Cut each strip into 3 bites. Skewer each bite with a field goal toothpick. Arrange on a platter for your football fans to enjoy. 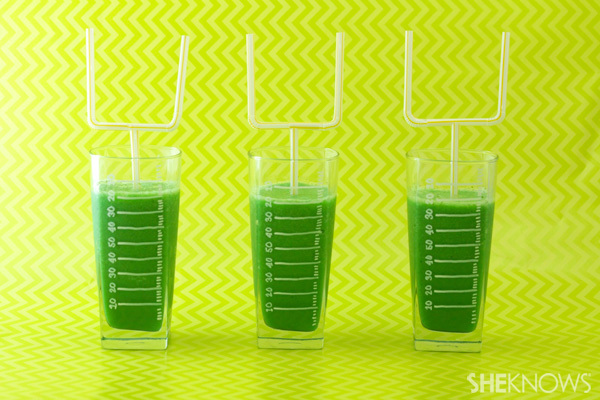 Find out how to make these festive Super Bowl-inspired frozen drinks.